Give me three pendant banner strings and I will abuse the heck out of them. 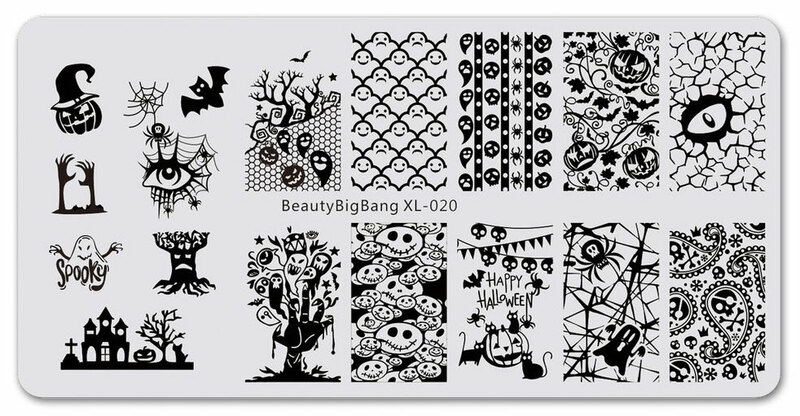 This entire design was created from one full nail image on Beauty BigBang’s XL-020 stamping plate, which I am reviewing today. Yesterday’s review was really, really long. So today let’s all agree that this is a good quality stamping plate. I think its particular advantage is that it is composed of images that can be separated and recombined to create a lot of different looks. And, while the style of the images doesn’t always match up across the plate, they coincide enough that you do have options when combining them. Example: some of the pumpkins are cute and some are wicked, but there’s enough of both that you can create varied looks with them. Webbing in My Eye. Background is Sinful Colors’ Kylie Jenner “Haute Koffee”. Stamping done with Sinful Colors’ “Casablanca” and filled in with Revlon’s Parfumerie “Espresso” + Sephora’s Formula X “Hyped” and “Jolt”. I have seen someone flip the eye over to create a whole face. Very clever. Back to where my heart is: the kitties. 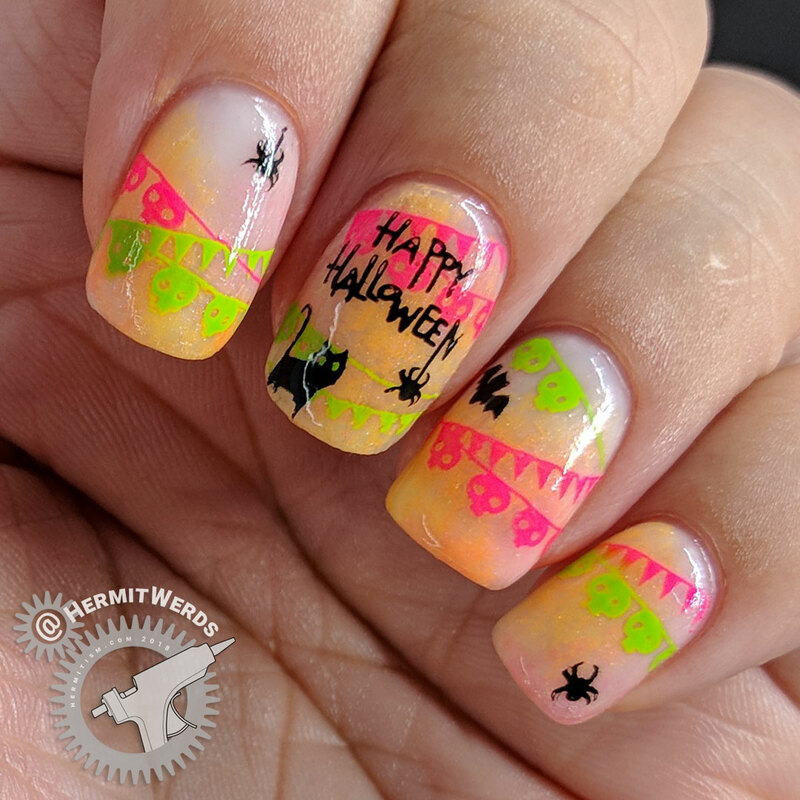 Born Pretty’s Opal White gel reusable base with a little Ms Sparkle’s “Dutch Tulip” and Sinful Colors’ Neon Collection “Bright to the Point” sponged on top. I wanted this to be cute and bright to offset all the ‘tude coming from the cats. 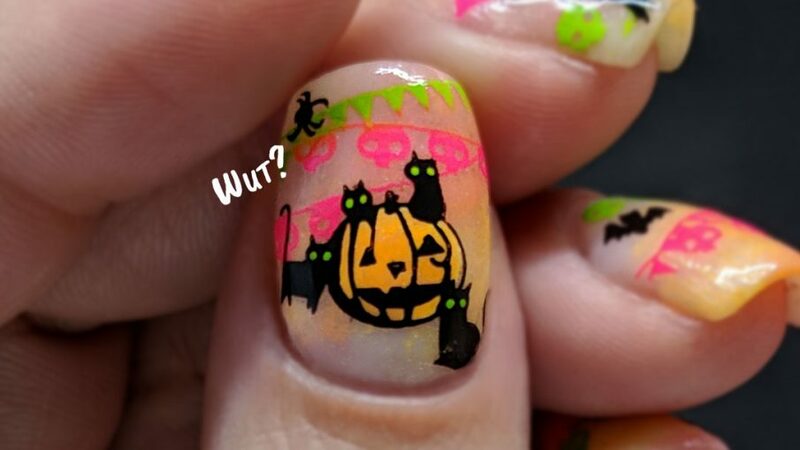 So I used a lot of neon starting with a few dabs of color on the opal white gel polish and then on with the stamping. 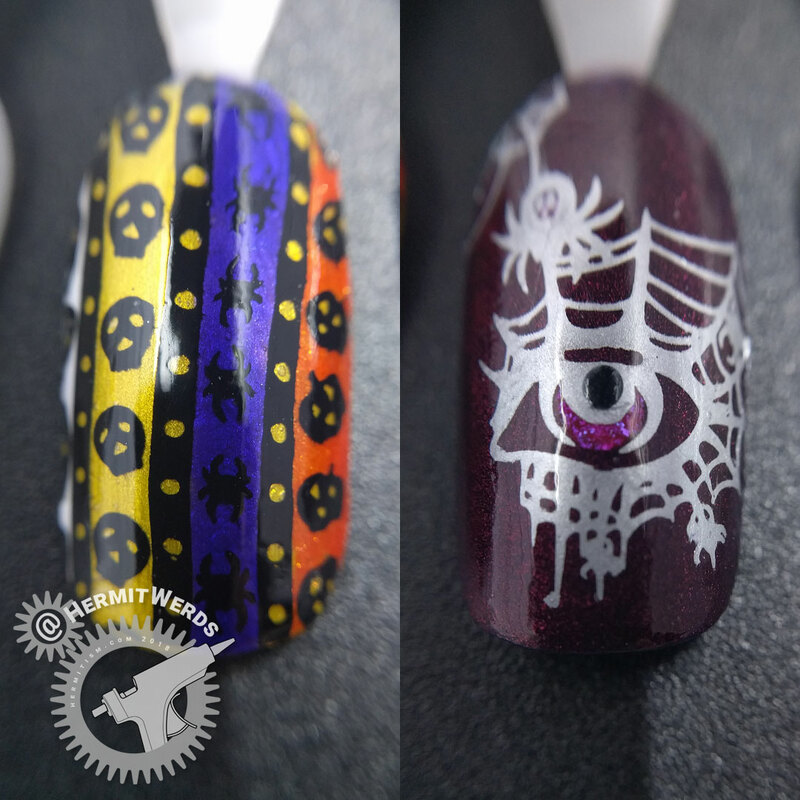 I painted a few nails at a time with nail foil glue and then picked up the pendant banners over and over again until my nails were covered. I tried to keep it simple for myself and mostly stuck to one color for the two crossed banners, but I did pick it up twice with two different colors with only a little bit of bleed between them. This design was a lot of careful pickup and using tape to remove the parts of the image that I didn’t want. Worth it. About half-way through I wondered if I shouldn’t have tried to use the glow in the dark powders with this design. I’m glad I didn’t though. I think bolder patterns lend themselves well to glowing and there were too many small details here. I love this stamping plate. It has a nice blend of images that match my personal style well and only a few images that I doubt I’ll ever want to use. 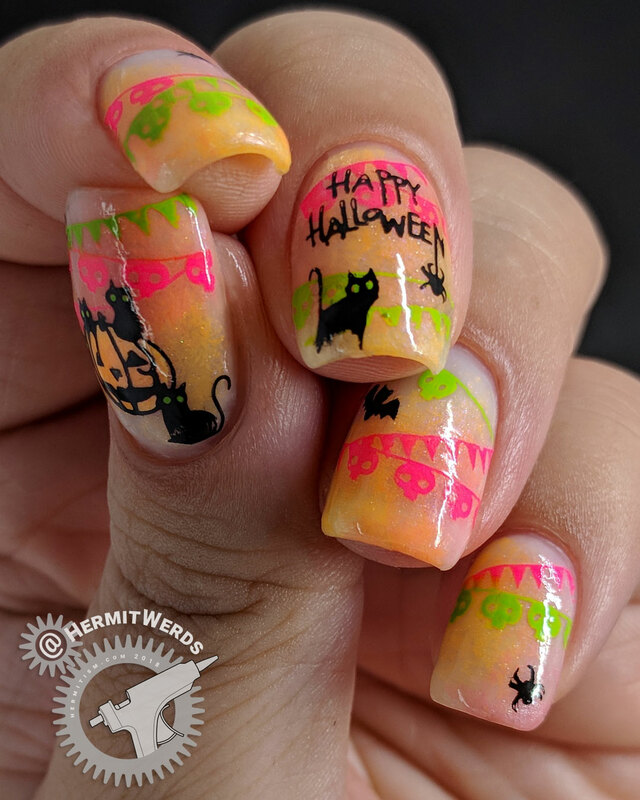 The words “Happy Halloween” are also small enough that even an adult with narrow nails could probably fit it on their thumb without shrink stamping. 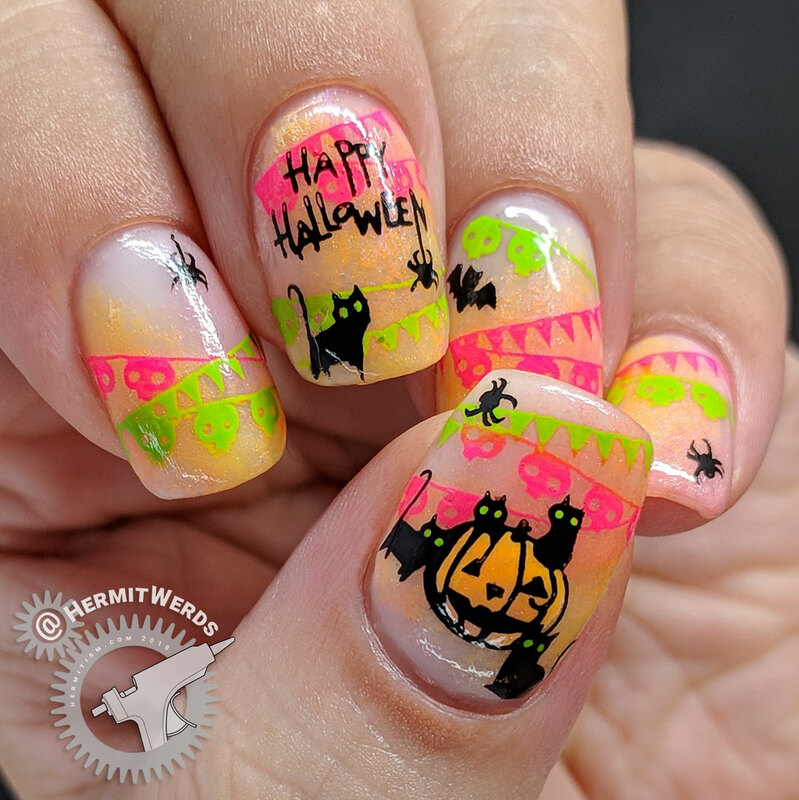 Honestly, I find it annoying that so many designs of “Happy Halloween” are one long string. 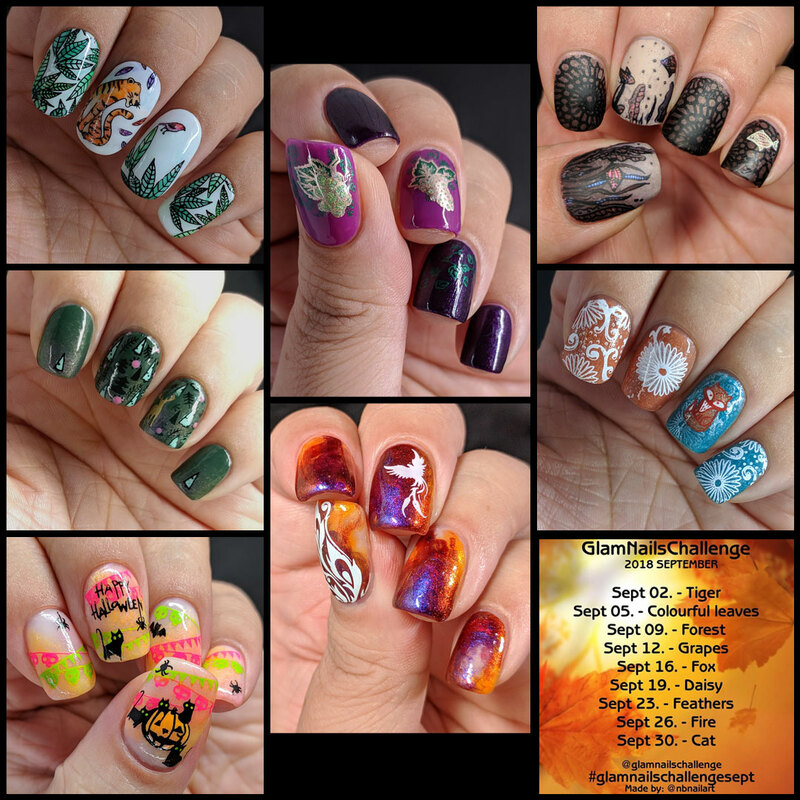 Like…that’s really hard to get to line up across your nails and that also means your design is now about spelling. Yay? If you’re interested in the stamping plate (BBBXL-020) feel free to use my discount code (hermi) for 10% off your order. (Non-affiliate code). Thanks again, Maggie!